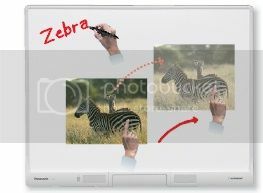 The elite Panaboard is an advanced educational tool that engages students' attention. It makes it easy to create effective, eye-catching teaching materials and promotes a style of active, visual-based teaching and learning that makes the classroom fun for both teacher and students. By connecting a PC with Internet access and a projector, you can bring the huge amount of information available on the Web or any information on your PC right into your classroom. 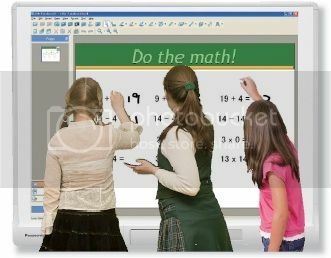 Panasonic and the elite Panaboard open the door to a new kind of active, visual-based education. Operate with a finger or the Electronic Pen Seamless "Drawing & Controlling"
All board operations can be performed with the touch of a finger, and your finger's movement is relayed directly to the board surface for smooth, comfortable operation . Or you can use the handy Electronic Pen for writing characters and drawing lines. This enables seamless drawing and object operation. This makes discussions and brainstorming sessions more efficient and active than ever before. The board surface is so hard that nothing short of a sharp knife can scratch it. It withstands splashes of coffee, milk, etc., and wipes clean with water or neutral detergent. It also resists discoloration from direct sunlight. The height adjustment function* makes the Panaboard easy for anyone to use, from children to adults. Wall mounting and casters* allow it to be set up in various places, for use in schools, offices, or just about anywhere. * Optional stand is required. * The optional stand comes in two types, the Normal Stand and the Height-Adjustable Stand. When using the Normal Stand, you can choose from four different height adjustments when setting up the stand. When using the Height-Adjustable Stand, you can freely adjust the height even after setting it up. Built-in stereo speakers eliminate the need to add on external speakers. Videos with sound and the use of sound effects help to attract the participants' attention and make meetings more effective. * This option is not available in certain destinations. 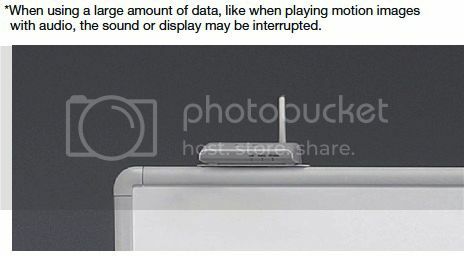 * When using a large amount of data, like when playing motion images with audio, the sound or display may be interrupted. The elite Panaboard is equipped with two additional USB ports. This allows you to connect additional devices to enhance your meetings such as a document camera, a web microscope, or even a printer without using up the necessary resources in your PC.